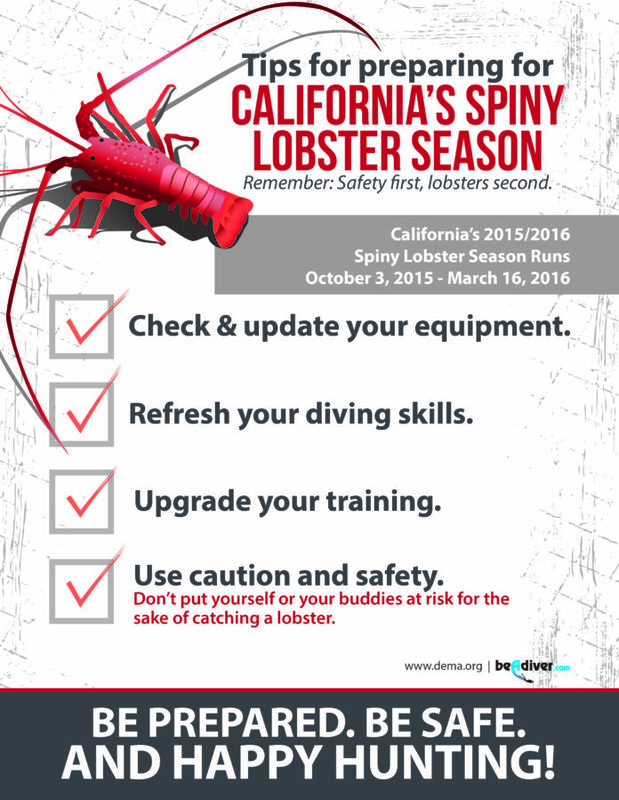 With California’s 2015/2016 Spiny Lobster Season beginning on October 3rd, 2015, the Diving Equipment & Marketing Association has released a new Public Service Announcement (PSA) in an effort to increase diver safety. “The new PSA is part of DEMA’s ongoing efforts to encourage divers to refresh their training and maintain their equipment prior to getting back in the water,” according to the association. The commercial is available in English and Spanish, in both 30-second and 15-second formats. The English version features Miss Scuba International 2014-15 Tabitha Lipkin, and the Spanish version shows bilingual reporter Yanula Ramirez. In addition to the new PSAs, DEMA also released a new poster for viewing, sharing and downloading. Complete information and regulations for the 2015/2016 California Spiny Lobster Season can be found on the California Department of Fish and Wildlife website.